Zyppah Reviews 2019: Does this Snoring Mouthpiece Work? If you are looking for anti snoring devices, you may have come across one known as Zyppah. In this Zyppah review, you’ll find out about the anti snoring device, how it works and what you should expect. Zyppah, (Zee pah), is stylish Mandibular Adjustment Device (MAD) that is used to stop snoring. The device stands out in its black and neon green colors and has a tongue stabilizing strap (also known as the Z-flex technology). The strap stretches horizontally at the back of the device from one side to the other. 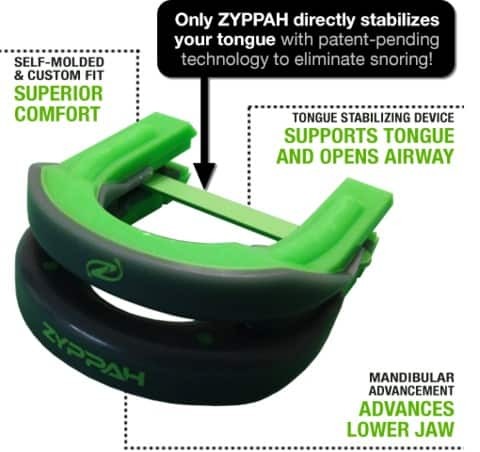 The tongue stabilization and jaw adjustment functionality make Zyppah a premium snoring treatment device. Zyppah: How Does it Work? Does Zyppah work for Sleep Apnea? There are two Zyppah models available on the market: an over-the-counter version that consumers can purchase without prescription online and a Custom-fit prescribed. You need to see a doctor at any of the five “Snore No More” centers to get the prescribed custom fit version. However, you can purchase the over the counter version without a prescription. The Zyppah custom-fit version uses a mandibular advancement feature together with an elastic band. The jaw advancement tightens the muscles and the tissues at the distal end of the throat. On the other hand, the elastic band helps keep the tongue from blocking air passage when you are sleeping. The over-the-counter version (available on the Internet) only treats snoring but NOT sleep apnea disorder. Zyppah only helps to stop snoring. The snoring mouthpiece doesn’t address any present underlying cause. Like is the case before taking any OTC oral medications, you should talk to your doctor about your condition. Only a sleep specialist can determine whether you have a medical sleep disorder, like central sleep apnea, obstructive sleep apnea, or both, or you are just a snorer. You should not prescribe for yourself an OTC device to treat a sleep disorder without consulting your doctor. If you study the Zyppah website, you will realize that the term “sleep apnea” has not been mentioned even once. The reason for this is quite simple; Zyppah is designed only for treating a medical condition that has been well diagnosed. Just like is the case with other anti-snore devices, it takes some days to get used to Zyppah. Generally, you will feel comfortable wearing the device within a week. Zyppah will decrease your snoring noticeably, once you are used to it. The device’s tongue-stabilizing strap cannot set off gag reflex. The elastic band on the snoring mouthpiece has been placed strategically to ensure it doesn’t interfere with your gag reflex. Zyppah uses “boil and bite” technology. This makes the piece that attaches to the teeth surface fitting and comfortable. To use the snoring mouthpiece, you need to place it in hot water, remove it and let it cool before placing it in your mouth. When in the mouth, bite down and hold to make an impression. The material will adapt its shape to your bite while it cools. 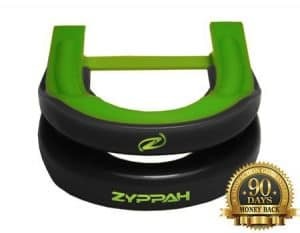 Zyppah antisnore device is capable of jaw advancement. If you need to adjust the device, consult your dentist. When a friend first told me about Zyppah, I was very doubtful of trying it. And why wouldn’t I be? The tongue stabilizing strap looks like a colorful rubber band. How could it hold my tongue in place? I had tried a few other tongue stabilizing devices that worked by holding the tongue forward. These mouthpieces place the tip of the tongue into a device that resembles a pacifier with a sanction bulb at the tip. When squeezed, the bulb draws the tongue forward and holds it in place. Zyppah works in a different manner. The mouthpiece holds the tongue down and in place using a soft strap that resembles a rubber band. ordered my Zyppah and USPS shipped it in three days. Opening the box, I found an instruction manual, a storage case and the device. The instruction manual was easy to understand. The fitting process was just like is with the other devices, except for the tray design. Standard “boil and bite” MADs devices have some kind of recessed tray with walls that get your teeth in the correct fitting position. Zyppah doesn’t have this. Therefore, you have to read the instruction guide to get the correct fit. You will have to use a mirror to make sure that the upper and lower teeth are put accordingly before biting down and taking an impression. Here is an overview of the fitting instructions. Carefully remove Zyppah from its package and rinse it well with warm water from the pot. Heat the water in the pot until it gets to a boiling point. Remove the water from fire and leave for one minute or so before proceeding. Using a pair of tongs or a slotted spoon, dip the mouthpiece in the hot water for 45 to 60 seconds, but while holding it under water so that it kind of floats naturally. Next, carefully remove the device from the hot water and let it cool for 20 seconds. At this point, the thermoplastic material is very soft and quite sticky. Therefore, be very careful with it. I recommend handling it by the hard plastic portion or the rubber strap. Check the Zyppah mouthpiece carefully before continuing your fit. The side that has the inscription “Zyppah” is the lower tray. You will see that it rests slightly in front of the upper tray. Look into a mirror and ensure that the lower teeth-line butts right up against where the harder back plastic meets the softer green thermoplastic. Next, place the device into your mouth. Once aligned, stretch your jaw forward until the outer edge of the upper teeth is resting against the upper tray area where the hard and soft plastic meet. Then, firmly bite down and hold for one minute. You will feel your teeth sink into the soft green thermoplastic. After about one minute, carefully remove the anti snore device and drop it into the cold water mug or run it under a cold water tap for about 1 minute. Once it has cooled, check it for fit. In case it doesn’t fit perfectly, repeat all the above steps, starting by reheating the gadget. For two weeks straight, I wore the Zyppah mouthpiece to test whether it reduced my snoring. There are front open air holes on the device that make it easy to breathe freely. After using Zyppah for about 4 days, I realized that my jaws felt a bit sore when I woke up in the morning. But each day I felt the soreness, it receded within an hour. Several days later, the sore feeling went away completely. I also drooled a couple of nights. But this also stopped after some time. You can expect these side effects when you start using Zyppah. However, they will end after a few days of use. I purchased Efferdent denture cleaning tablets, which I used to clean Zyppah every morning. I soaked the snoring mouthpiece temporarily, and then allowed it to air dry before putting it back once again. Yes, I can testify that the Zyppah was absolutely effective in controlling my snoring. I think the jaw advancement feature played a major role in controlling my snoring. However, it’s also possible the tongue stabilizing strap also helped. If your snoring is caused mainly by a relaxed tongue, the tongue stabilizing strap will benefit you more. The cost of Zyppah changes from time to time. At the time of this review, the snoring mouthpiece was being sold at $99.55. Click here to check the current price on the official website. Zyppah is one of the best stop snoring devices on the market. The mouthpiece helps to eliminate snoring by using both tongue stabilization and mandibular repositioning. It’s also comfortable and less obtrusive than most anti snoring devices in the industry. However, Zyppah is costlier than most snoring devices in the market. Apart from this, the mandibular advancement setting cannot be adjusted.